1 or fewer specialized surgical team members exist for every 100,000 people in Afghanistan and many developing countries in Sub-Saharan Africa. A hospital in Afghanistan: Only a few bravehearts dare to work as surgeons in these hospitals, healing patients in need. The Lancet Commission on Global Surgery data shows that 1 or fewer specialized surgical team members exist for every 100,000 people in many third world countries. Why is it that there are such low amounts of specialists? Because they value their lives. Companies also need to be able to finance such projects such as "Doctors without Borders". They need to know if it’s worth it to pay for their travel, their food, etc. Would you be a surgeon somewhere where your life is at risk? Most people would not. 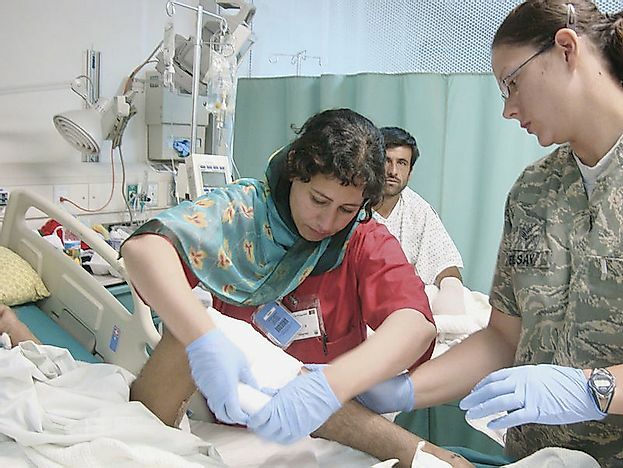 In war-torn countries such as Afghanistan, there are little to no specialist surgical team members because their life is at high risk, or they don’t get paid. During the battle of Kunduz (a city in northern Afghanistan) the hospital where doctors without borders were working, was subjected to bombings by the Americans during their fight against the Taliban. Many doctors and surgeons died. After being aware of such news, not everyone is willing enough to go such countries to help and often being paid little to nothing for their work. Everyone wants to survive. These countries also do not have the greatest education system. If someone from those countries goes to university to become a surgeon, they most likely would not want to stay in their war-torn country. They would choose to go to a first world country, where they can get a substantial sum of money. Third world countries such as Afghanistan, Nigeria, Somalia, etc. do not pay well. Companies like Doctors without Borders also think whether they have enough resources to fund their doctors to go to such places such as Kunduz. They think on how high of a risk there is for their doctors to lose their lives. Overall they go through many thoughts before they even consider sending their valuable doctors to such high-risk countries. Diseases are rampant, and casualties are high in third world countries, and without specialist surgeons, casualties will still remain high. Afghanistan has 0 specialists per 100,000 surgical team members, Nigeria has 1, Somalia has 0, etc. All the countries in this list, are third world countries, and many of them are facing war, civil unrest or other forms of situation that disrupt internal peace and security. History shows that peace will forever be an illusion. Since the dawn of time, conflict has always been relevant. When war stops, only a temporary moment of peace arrives, it doesn’t take long before war strikes once more. Peace is mankind’s illusion. We know this is the truth, yet we still cling on to this dream. Perhaps there is a way to achieve this dream. Surgeons shouldn’t be the only people helping others. We should hold each other’s hand and help every neighbor we can and hope to strive towards a peaceful future; no matter how unlikely it seems. Are There Countries Without Internet Access?